I have a confession. I’ve never made panna cotta. But a couple of weeks back, I was attending a Top Chef Canada party at the Cactus Club, where Chef Matthew Stowe (now Top 3! Go Matt!!) was in attendance, and made this savoury panna cotta. 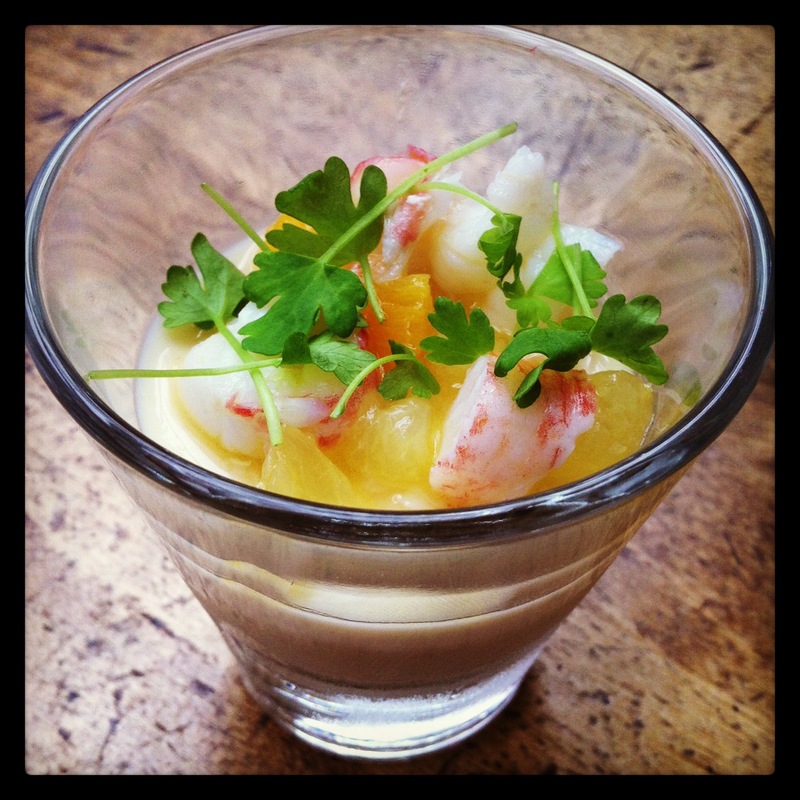 It was a Cauliflower Panna Cotta with Citrus, spot prawns and micro greens, and it was delicious! I’m pretty sure I’d never had a savory panna cotta before. In fact, my life has been lacking in panna cotta in general. But after eating Chef Matt’s, I was determined to change that! 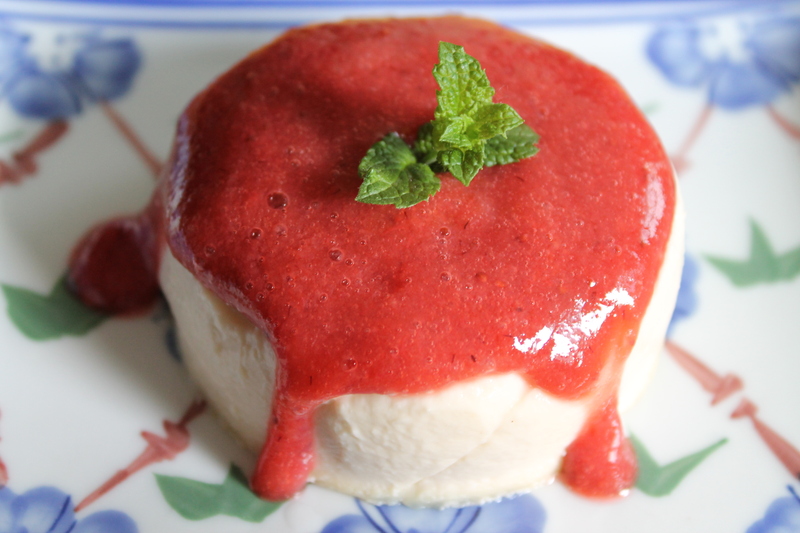 There is something about the mouth-feel of panna cotta–its silkiness in your mouth is a hedonistic delight. Panna cotta is actually really simple to make. You know how much I love my creme brûlée. I thought it would be on an equal level of difficulty, but it actually is much simpler, even though it’s made with similar ingredients. The toughest part of panna cotta is unmolding it. But there’s a very simple solution to that–don’t. Serve it in the mold. I made some of mine in ramekins, which I did unmold and then sauced, but I made some in mason jars, and I just served them as-is, with the sauce on top. There were a lot of compliments. Michael and I had just been to the Farmer’s Market, and came home with fresh strawberries and rhubarb, which got turned into a compote. The sweet-tartness of the compote with the smooth, creamy panna cotta is an absolute winner-winner-chicken-dinner. Lightly oil four custard cups with a neutral-tasting oil (vegetable or coconut). In a separate, medium-sized bowl, sprinkle the gelatin over the cold water, and let stand 5 to 10 minutes. Heat the heavy cream and sugar in a saucepan over low-medium heat. Once it is steaming, remove from heat and add the vanilla. Divide the Panna Cotta mixture into the prepared cups, then chill them until firm (at least 2 hours). Unmold (or don’t) and serve with Strawberry-Rhubarb Compote on top. This is your last week to vote for me as Vancouver Mom’s Top Mom Blogger! Voting ends June 10–give me some love? It’s been a pretty exciting week! I got chosen as one of Vancouver Mom’s Top 30 Mom Bloggers! That’s pretty darn cool. Oh (and here comes the shameless self-promotion part), I’d love it if you would vote for me. You can vote for me and two other mom bloggers, once this week, and once next week. The big party/awards presentation is June 19. Hope I can get a babysitter! So. I’m feeling like celebrating. The blogging nomination thing is pretty cool. Plus, my local Farmer’s Market opens this weekend. There are certain things that mark, for me, the real arrival of spring, and none of them really have to do with equinoxes. Most of them have to do with food. I know when I go to the Farmer’s Market, and I can buy rhubarb and garlic scapes, that spring is really and truly here. When I was kid, we had a huge rhubarb patch in our backyard. My mom used to hand me a stalk and a bowl of sugar, and I’d chomp down on the tart stalks, their edge taken off by the sugar. As an adult, I still love Rhubarb, and it pairs especially well with strawberries, the sweet and tart balancing each other out. There’s usually a pie (there’s one in my fridge right now! ), and last year, I experimented with an upside-down cake. Tonight’s experiment is a little more… grown up. Mojitos and sangrias are my go-to summer drinks. Loaded with fruit and ice, they cool and refresh on a warm summer night. 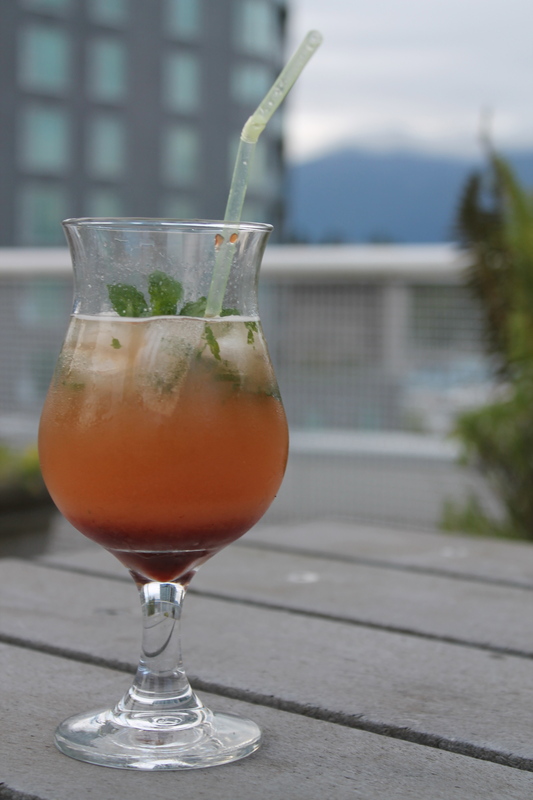 I have a big pot of mint on my balcony whose sole purpose is to keep me supplied with mojitos all summer long. To make puree: take about 3 stalks of rhubarb, and a couple cups of berries. Stem the berries and wash everything well. Cut the rhubarb up into 1/2 chunks, and quarter the strawberries. Place in a saucepan with about a cup of water, and let it all boil down until it’s mush. When cooled, blitz it in the blender to make a puree. Finally, run it through a sieve to get out the really fibrous bits. 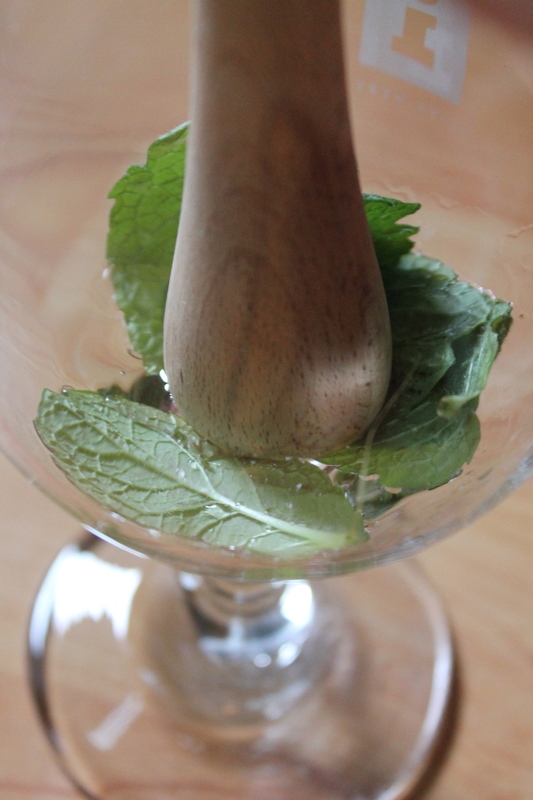 In a tall tumbler, muddle the mint with the simple syrup. I have a muddler, but you can use the skinny end of a wooden spoon just as well. And by “muddle,” I just mean mash the crap out of it, until it’s a green, pulpy mess. 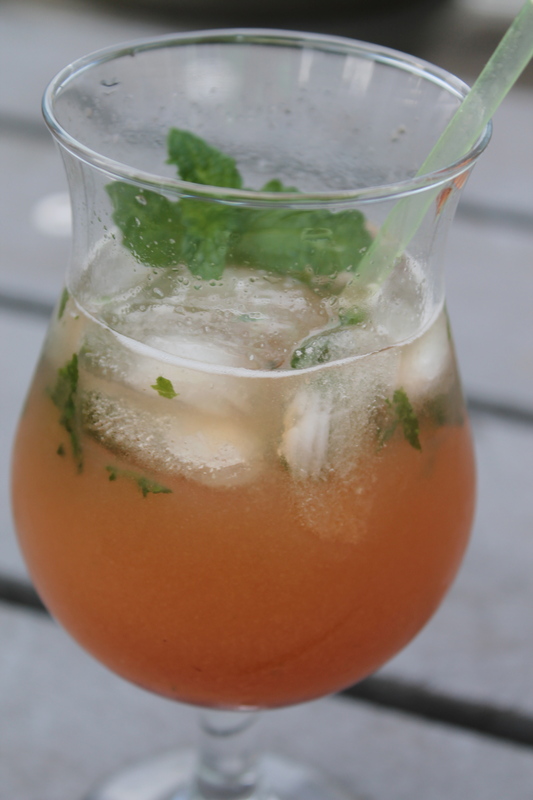 Add the strawberry-rhubarb compote, rum and mint, and stir well until it’s mixed. Add a handfull of ice, and top with soda. Garnish with slices of strawberries or mint leaves.